Paneer is a healthy milk product which is made by curdling milk with the help of vinegar, lemon juice or any other food acid. Most people like paneer, be it children or adults. Most of the paneer dishes are usually side dishes which are had with rotis, parathas etc. So, here are a few snacks that you can try! • Cut paneer into medium sized cubes. • Cut onion, capsicum and tomato into medium sized squares. Remove tomato seeds. • In a bowl, mix curd, chilli powder, salt and jeera. Add the cut vegetables and paneer and let it marinate for 2 hours. 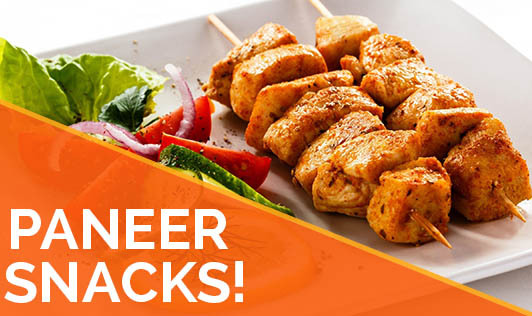 • Prick a piece of each vegetable and a cube of marinated paneer to a toothpick or a skewer and grill it in an oven or microwave till it turns slightly golden. Note: You can even roast paneer and vegetables on a hot tava. • Mix all the ingredients (except brown bread and oil) in a bowl. • Dip a slice of bread in water and remove immediately. Place 1 tbsp of the paneer mixture and cover it. Make it into the shape of a cutlet. • On a hot tava, pour oil and place the cutlet. Cook till the colour turns golden brown. Turn it over and cook on the other side. • Serve hot with mint chutney or tomato sauce. • Heat oil in a non-stick kadai. Add paneer cubes and sauté till it turns golden brown. • Remove from the pan and add salt and chilli powder. Mix well and serve.